Chilcompton is the latest of a number of Somerset & Dorset based exhibition layouts we have built. It is based on the prototype station of the same name, which was situated on the main line between Midsomer Norton and Evercreech Junction. The era is set sometime between 1950 and 1955 and all the stock used represents what would actually have run over the real line at this time. 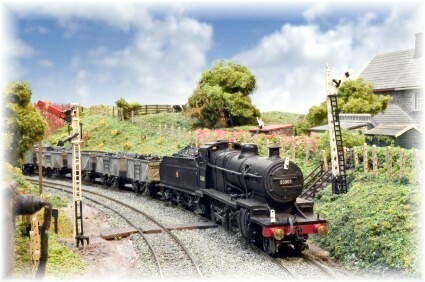 The scale is 4mm using "OO" gauge track. The whole of the station and goods yard area is modelled to scale. However some artistic licence has had to be taken so as to curve the track formation at each end into the fiddle yard. The fiddle yard features sixteen roads and is capable of holding 24 separate trains. All the buildings on the layout are scratch built, mainly using thick card for the basic structure. These are covered with plasticard to represent stone or brick finishes . Magazine Features: The layout was featured in the September 2006 edition of Railway Modeller and the eighth edition (February 2008) of the Hornby Railways magazine. Back in March 2005 - Whilst exhibiting the layout at the West of England Model Railway Exhibition in Cornwall our hire van broke down and the van complete with the layout inside of it was transported on a recovery truck to Plymouth to get a replacement van. The recovery lorry driver decided having a model layout on the back of his truck was the second most unusual item. The most being a life boat. The other quirk was the lorry driver lived not far from the real Chilcompton village. 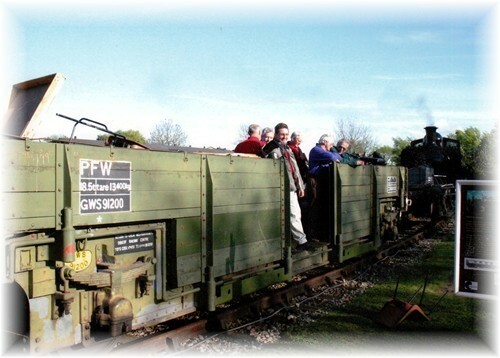 Back in May 2007 - After exhibiting the layout at an open weekend at the Didcot Railway Centre they transported the layout across the site to where we needed to load the layout into the van to transport it home by a steam hauled freight train using pannier tank 3738.